Name Necklace, Handmade, Personalised, So very fashionable and fun to wear. Vintage Scrabble Tiles are top-drilled then threaded onto the black waxed cord with silver plated ends and clasp. Price from £4. Such a HOT fashion accessory that even the Oh So Trendy Gok Wan wears a similar Scrabble Tile Necklace !! Then write the letters in the correct boxes. ie - for LOVE, fill in the first 4 letter choice boxes. Choose cord length you want. 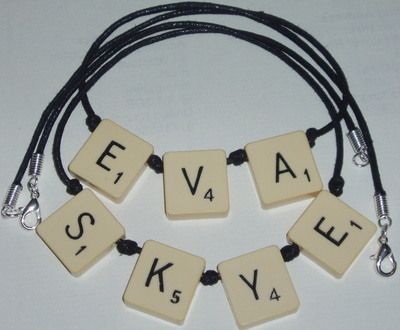 I recycle Vintage Scrabble letters so you a necklace made using thick round back black letter tiles. NB - J's and K's are sometimes in short supply, so any jewellery with these letters may take up to 10 working days to process and dispatch. Normal dispatch for all other letters is approximately 4 working days.